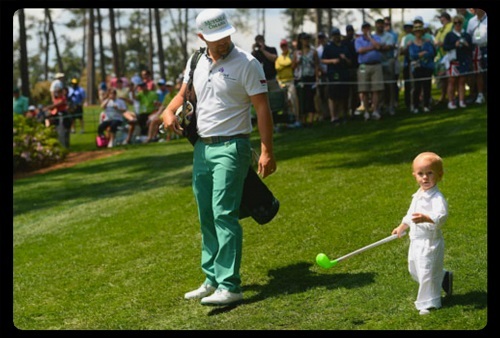 Last night the masters started in earnest as families took to the Par-3 Course at Augusta to compete in the fun and refreshing start to the tournament. Here are 5 reasons we love the Par-3 Contest. Every year the winner of the Par-3 Contest plummets in the betting rankings as the winner of this contest has never gone on to win the Masters in the same year. That curse brings out a very superstitious side in many golfers and quite often you will see golfers with a chance purposely withdrawing. Every year you will hear the winner say they are not scared of the curse, yet every year they don’t win it. So don’t go putting any money on Ryan Moore. 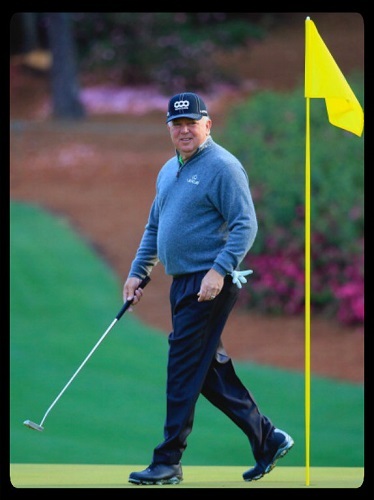 What is Gary Player doing? Is there a better trio in world golf than Gary Player, Arnold Palmer and Jack Nicklaus. And it was these three together that make the best scene of the par-3 challenge. Sure they have gained weight (Not Player), lost distance and aged in a very respectable way, but these three giants (34 majors together) still have what it takes to pack the galleries. The jokes, the fan interaction and overall aura that comes along with the three icons is simply irreplaceable. Golf can be a lonely sport. You spend vast amounts of time competing and travelling the world and this kind of disruption cannot be easy for many families. But the par-3 challenge invites the ladies to join their men and walk the hallowed turf. Whether it’s a wife, a fiancé (Like pink-haired Wozniaki), a girlfriend, a brother, a son, a daughter or a friend, the par-3 challenge lights up the course with affectionate laughter as golfers delight at having their families alongside them on the course. I don’t think there is a start to a tournament quite as awesome as this. Maybe I’m a little bit broody (Don’t tell my wife), but the kids at the par-3 Challenge steal the show. The likes of Caleb Watson, Dash Day, Jana Oosthuizen, Dowd Simpson and Tucker Moore owned the course in their array of white overalls and green caps. The next generation of the golfing superstars have the style and swagger to match and many seem at ease on the course. I honestly wish I could qualify for the Masters as a father one day, to take my little guy (or girl) with! As far as seeing a hole-in-one in golf goes, there are very few that happen. But the nature of a par 3 course means that occurrences are far more frequent. There have now been 80 Aces in the history of the competition as yesterday Mark O’Meara (1998 Champion), Buddy Alexander and Matt Jones all secured their little piece of history. It was remarkably O’Meara’s second ace in the competition (He got one in 2007).